Master Indian violinist Pandit Sukhdev Prasad Mishra comes from an illustrious musical family of famous Indian Banaras (Varanasi) Gharana. 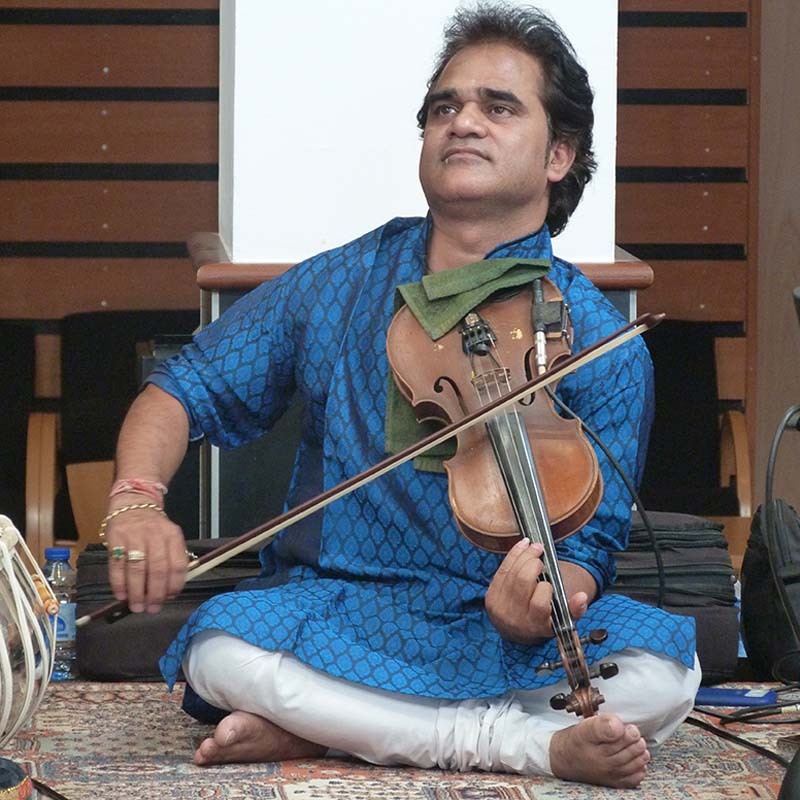 He is recognised for the faithfulness with which he renders traditional raags and internationally renowned having performed in UK, Switzerland, Germany, Austria and France. In India he is recognised for his outstanding contributions to Indian culture, with the status ‘Pandit’. As evening approaches in India’s oldest and holiest city of Varanasi, the ancestral home of these two players, the hypnotic sounds of intricate ragas being played on the Indian violin and bansuri flute swirl and eddy across the city. In an Indian lotus garden, the sublime sound of the violin wafts through the scented evening air. Violin virtuoso Sukhdev Mishra, accompanied on tabla by Shen Flindell, plays hauntingly beautiful evening ragas, under the night sky. Listening to the pure, melodic expression of the bansuri flute and the Indian violin offers insight into the spiritual complexities lying within Indian classical music that can lead the listener to a state of bliss. Wherever the European violin crossed borders, its tuning, playing posture, styles and techniques evolved independently, creating their own unique character. Discover how the violin adapted when it crossed borders between the vastly different regions of Transylvania and India. Indian music composed for the sunset time is featured at this stunning outdoor venue. Spreading the serenity of the late afternoon into the twilight are evening ragas for bansuri flute with Vinod Prasanna and Indian violin with Sukdhev Mishra. Both are accompanied by Shen Flindell on tabla. Bengali sitar maestro Saikat Bhattacharya and Varanasi violin virtuoso Pandit Sukhdev Mishra, play ragas for the ‘second beat’ of the night, when they are at the height of their majestic beauty and splendour. Follow the music from the Himalayas as it travels along the Ganges to the eternal city of Varansi, where the intense and timeless sound of the Indian violin awaits the arrival of sublime Tibetan flute-song.